Faithful Drunkard Christopher Waldrop wanted to see a picture of Benedict Cumberbatch taking a selfie with a monkey. I am nothing if not accommodating. Technically, a Sumatran orangutan is an ape. But we're all monkeys inside. And if Benedict doesn't mind, neither should you. 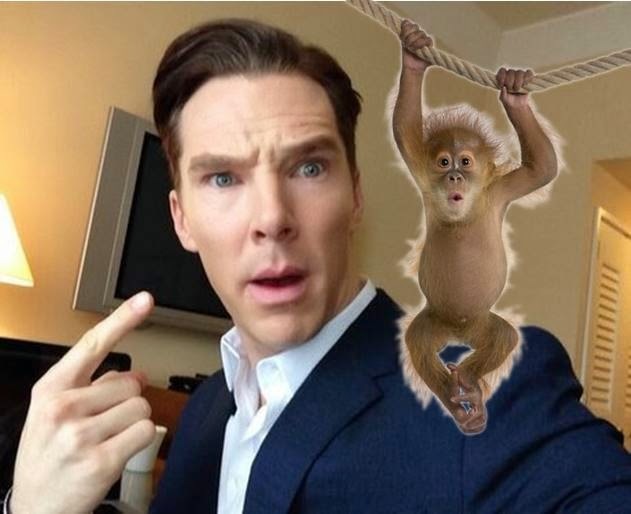 I had a very clear vision of the picture of Benedict Cumberbatch and a monkey I would have liked to create if I had the skills. It was hilarious and amazing. This is a million times better. I can't thank you enough.